Pakistan's new prime minister Shahid Khaqan Abbasi became the country's first premier to fly in a US-made F-16 fighter aircraft. Pakistan's new prime minister Shahid Khaqan Abbasi on Saturday became the country's first premier to fly in a US-made F-16 fighter aircraft, officials said. 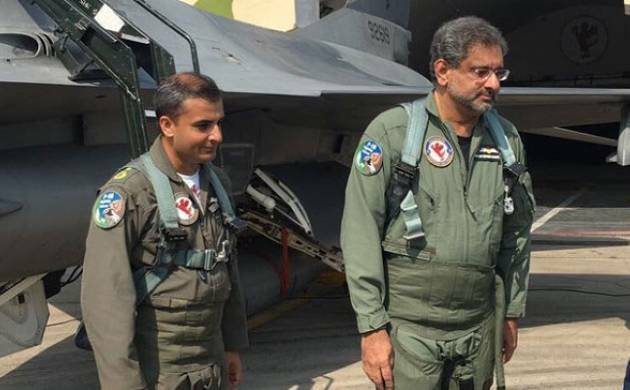 Abbasi, during a visit to the newly-established Airpower Center of Excellence (ACE) at an operational air base of the Pakistan Air Force (PAF), flew in the single-engine supersonic multirole fighter aircraft. The 58-year-old became the first-ever prime minister of Pakistan to participate in an air force sortie. The US-made F-16 fighter aircraft belonged to the No 9 Squadron of the PAF. Air chief Sohail Aman, sitting in another F-16 aircraft, also participated in the training mission. It was the first time in the history of Pakistan that a prime minister participated in a flying mission sitting in the rear cockpit of a fighter jet. The facility at the Mushaf Air base in Punjab's Sargodha city is a premier institution which has been equipped with state-of-the-art facilities and infrastructure. Besides training PAF personnel, the ACE would also train the combat crew of friendly air forces by conducting multinational, training exercises, the report said. Abbasi was briefed on the ongoing exercise 'Saffron Bandit' and was informed that the first-ever multinational exercise will be held in October and would have participation from personnel from 19 air forces. 'Saffron Bandit' is a combat exercise by PAF involving fighter jets and ground troops with elements from the Army Aviation and Army Air Defence. It is held once in three years.